Made it onto the Blizzcon screen! Shoutout to FlaShFTW and destructicon for their great work! 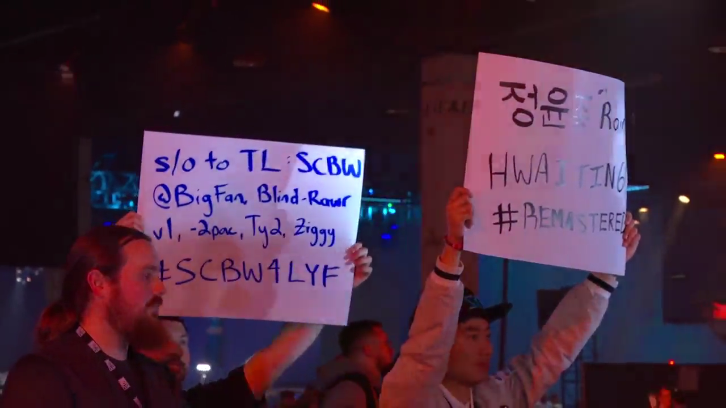 thanks Bigfan for begging to TL to send me out there lol. Blizzcon was so much fun. Might do my own blog post soon. haha np, though you should probably use some other language to convey when went down! I like appreciation shoutouts like this. ffs, how am I going to handle all this fame now? Love it when nerds come together. Well, regardless, holding your seat, and guarding your cheerfuls were vital to the operation! haha. indeed! didn't write him on the sign since he was there in person. Rough. I only saw this when they were running the little video summarizing the results before the credits rolled, otherwise I would have had no clue this even happened.